United Spinal Association President and CEO Joseph Gaskins, VetsFirst Vice President Heather Ansley, VetsFirst Director of Veterans Policy Christopher Neiweem, and Senator Bob Dole following a meeting with veterans service organizations on the Disabilities Treaty. Before Congress left for its annual August recess, VetsFirst was instrumental in leading veterans’ efforts to pass the Convention on the Rights of Persons with Disabilities (Disabilities Treaty). When lawmakers return in September, we hope to push the Disabilities Treaty over the finish line. 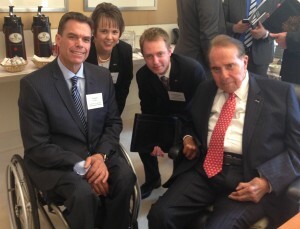 On July 23, VetsFirst participated in a press conference with former Senate Majority Leader Bob Dole, Senator John McCain, Senator Kelly Ayotte, Senator Tom Harkin, Senator Mark Kirk, and other leading veterans organizations in support of ratifying the Disabilities Treaty. The packed media event was a forceful show of support from the veterans community as organizations and Senators alike called for immediate ratification. The following week, VetsFirst’s Director of Veterans Policy, Christopher Neiweem, spoke to disability advocates from around the country at a rally on Capitol Hill. Our public support once again showed that the base of support for the treaty is wide-reaching. However, with a full calendar and too few days left before recess, further action on the treaty was tabled until September. In a couple of weeks, Senators will return to Capitol Hill. We urge Senate Majority Leader Harry Reid to bring the treaty up for a vote in September. Now is the time to let your Senators know that you support ratification, too.